Master's PhD Admissions 2013 by Mehran Universty Jamshoro, Pakistan. Mehran University of Engineering and Technology, Pakistan offers Admissions classes Application from open for PhD Degree Programs for July 2013 Session. 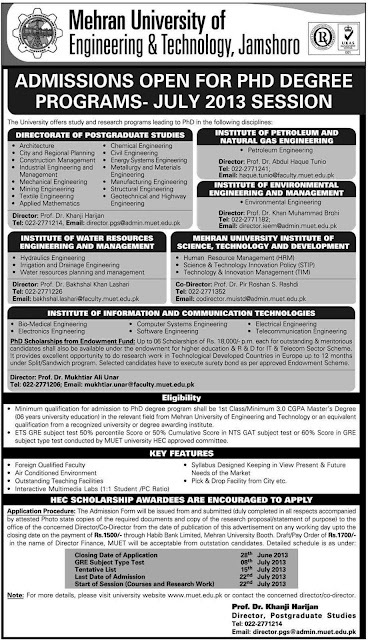 Master's PhD Admissions 2013 Mehran UET. • Closing date for PhD admissions application is 28th June 2013. • GRE Subject type test date is 8th July 2013. • Date for Tentative list is 15th July 2013. • Last date for admission is 22nd July 2013. • New session will start on 22nd July 2013. • Minimum qualification for admission in PhD shall be first class/minimum 3.0 CGPA masters degree. • ETS GRE subject test 50% or 50% cummulative score in NTS GAT subject or 60% score in GRE subject test. Item Reviewed: Mehran UET Jamshoro Admissions 2013 Online For PHD Degree 9 out of 10 based on 10 ratings. 9 user reviews.